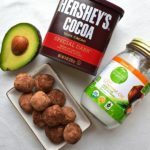 This recipe for chocolate keto fat bombs uses avocado to make a truffle-like treat in under 10 minutes. If you're following a keto diet, use liquid stevia, not honey. Combine avocado and coconut oil until the mixture is smooth. Add cocoa powder, honey (or liquid stevia), vanilla extract, cinnamon, salt, and heavy cream. Stir until the mixture is smooth. Place the mixture in the refrigerator for 10 minutes or until the mixture has hardened slightly. Roll into 1″ balls, then roll in cocoa powder if desired. Place truffles mesh strainer and shake to remove excess cocoa powder. Store the fat bombs in refrigerator or freezer. If you are following a keto diet, use liquid stevia instead of honey.